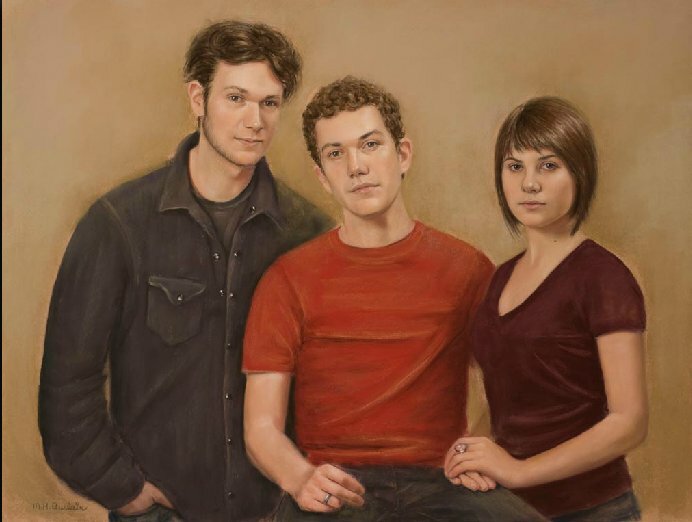 Bio: Tennessee native Lisa Fricker started her artistic career drawing portraits from life in a theme park. She attended art school in Nashville, and at Paier College of Art, Connecticut. She was awarded a scholarship to Scottsdale, where she studied with Bettina Steinke. Her work has been published in The Best of Portrait Painting, The Best of Flower Painting, and Painting More Creatively (North Light) as well as in the Pastel Journal and Pastel Art International. 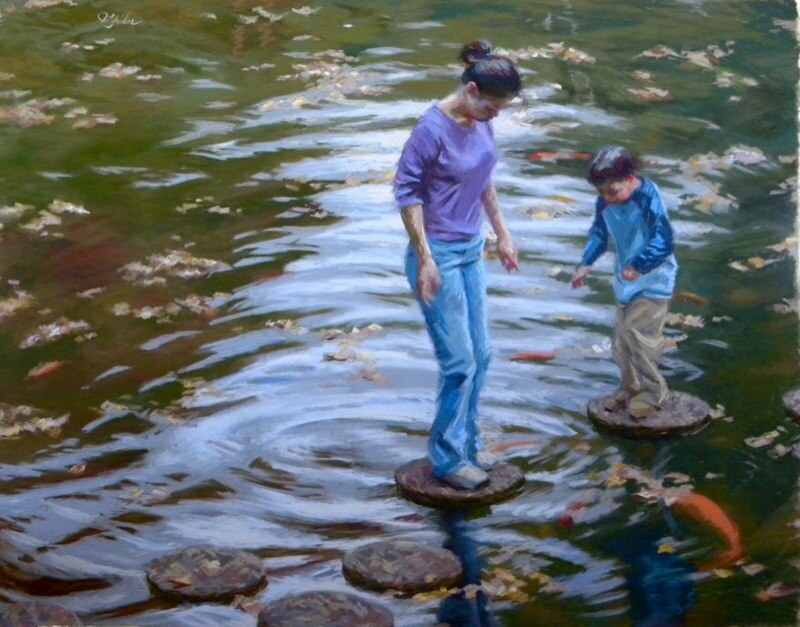 She is a member of Oil Painters of America, and holds signature status with the National Oil and Acrylic Painters’ Society; she is a Member of Excellence in the Southeastern Pastel Society. She has had seven solo shows to date. Style: Representational in an impressionistic fashion. Navigation: Both sites are similar. Links remain visible at top or bottom of pages. Gallery: Pastels available; Oils available; Archive (no dimensions or medium stated in this collection). Encounters is linked twice, both links ending in the same virtual show – mainly if not entirely pastels. This is wonderful plein air stuff on the move. Image View: Thumbnails enlarge in slideshow, but there is a download button. They may be saved. Gentle Waters is 32 x 40 ins, 800 x 627, 111 KB. Bio: Born in Toronto in 1953, Joseph Peller's independent development has generally favored private affiliation with artists whose body of work shared common themes with his personal vision. Initially, he studied with A.K. Scott, a Canadian artist and pupil of the distinguished American painters Charles W. Hawthorne, and George Bellows. While still in high school he received a scholarship from the Banff School of Fine Arts to study drawing with Geo Glyde. During formal study at the School of Architecture at the University of Toronto, he maintained a private liaison with Canadian painters Kenneth Forbes and Cleve Horne. His development continued in New York working with noted artists Thomas Fogarty, Jr., and Hilary Holmes at the Art Students League, and Ron Sherr at the National Academy of Design. During this time he received a Revson Foundation Grant from the Art Students League of New York, in 1985. 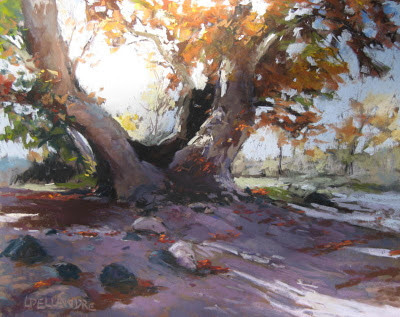 Peller enjoys experimenting with a wide range of pure and mixed techniques involving oil, pastel, various printmaking procedures, drawing and sculpture. The artist has been exhibiting since 1994 in solo exhibitions in New York and Toronto, and has participated in group exhibitions in the United States and Canada and Europe. Peller's work has received recognition in national exhibitions and mention in several publications including American Artist Magazine. He is the recipient of some prestigious awards. He has taught at the New York Academy of Art and currently teaches Painting and Composition at the Art Students League of New York. In 2006 he had a Residency at the Forbes Trinchera Ranch as guest of American Artist Magazine and Christopher Forbes. Joseph Peller is represented in public, corporate, and private collections in the United States, Canada, and Europe. Currently, he lives in New York City where he works out of his Brooklyn Navy Yard studio on the East River waterfront. Medium: Pastel, oil, bronze. Peller is not primarily a pastellist, but he is too important an artist to ignore. Subjects: Figurative. Joseph Peller's paintings, works on paper, and sculpture explore the haunting notions of isolation and ambivalence inherent in his images of individuals caught in the unnoticed rituals of modern urban life. Navigation: Links remain visible at top of page. There are only four pastels paintings to be seen on this website – but they are worth viewing. Gallery: Paintings (oil); Work on Paper (pastels, drawings); Sculpture. Image View: Thumbnails enlarge in new window. They may be saved. Ferry in Fog is 17 x 22 ins, 700 x 535, 85.6 KB. Bio: A fourth generation Montana native, Maggi Neal was raised in Billings, Montana and now lives in Ulm, just southwest of Great Falls, Montana USA in "Charlie Russell Country" as she puts it. Through the years, Maggi has studied under professional artists where she developed her unique style. She exhibits her work across Montana and Wyoming and shares her knowledge, talent and skills by teaching as a summer art class instructor for the C.M. Russell Museum in Great Falls, Montana. Maggi’s paintings have been juried into prestigious exhibitions such as the Western Masters Art Show in Great Falls, Montana and her work has been published in The Western Horseman. Now a fulltime artist, she is represented by the Billings Gallery of Fine Art, which is located in the beautifully restored historic Babcock Building in downtown Billings. Navigation: This website is pure blog. Image View: Images on blog enlarge in slideshow when clicked. They may be saved. Boots, Hats, and Cowboy Cat is 11 x 14 ins, . 1600 x 1201, 274 KB. Demo/Blog: This is a blog. Bio: Kristi Billmayer lives on the windswept prairie of Northern Montana, with her husband, two sons and other family members. Her work has been honored with numerous Best of Show and Juror's Choice Awards. She received the 2008 People's Choice Award at the C.M. Russell Art Show and Auction in Great Falls, where she exhibits annually. Her work is housed in collections throughout the US and abroad, and she is currently represented by Wyoming Gallery in Jackson Wyoming. Medium: Pastel. "I work almost exclusively in pastel because the immediacy of the medium allows me to develop a painting rather rapidly while the idea and inspiration are still fresh and exciting. I feel I have only begun to unlock the possibilities of this magical medium." Subjects: Animals – domestic and wild. No "pet portraits" thank goodness. Navigation: I find the navigation of this site somewhat confusing – there are galleries within galleries, without clear links to all, and often no link back to the Home page. 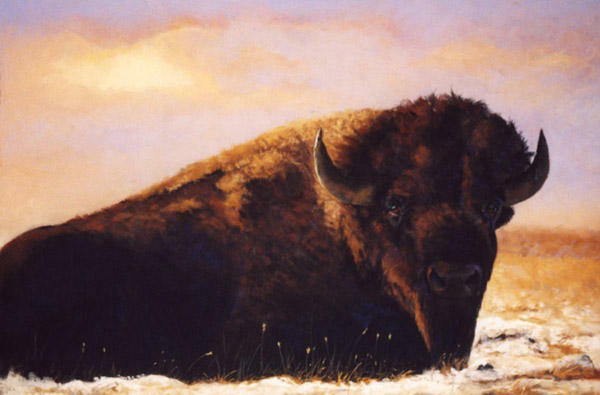 Some links don’t bring you to the page desired – “More Bison Images” on the Paintings page is a case in point. This artist deserves a better web presence. Image View: Thumbnails only. Unfortunately. There is no indication of the dimensions of the original painting. Bio: Lori Corradi was born and raised in New York City. She moved to Ojai in Southern California in 1986, world renowned as a destination for artists, collectors and outdoor enthusiasts. It is also the location for the television series Brothers and Sisters! 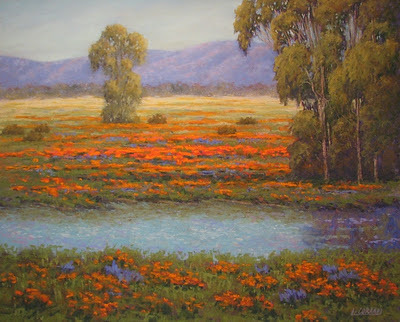 Lori enjoys painting the landscapes of Southern California and those she encounters abroad during her travels. She enjoys painting en plein air. Lori’s passion for the shapes, colors, textures, light and shadow patterns, and simultaneous contrasts found in nature inspire her to paint her landscapes. She has served on the committees of various pastel societies, and has been winning awards since at least 2008. Lori donates a portion of her art sale proceeds to non-profit organizations that protect the environment and wildlife. She also donates to organizations that are working to find cures for cancer, MS and other diseases, and which provide assistance to people who are living with illness and/or disabilities such as the Make A Wish Foundation and MS Foundation. She also supports the National Disaster Search Dog foundation (NDSDF) which trains and provides dogs to search for disaster victims around the world (Lori is the proud owner of a Golden Retriever that accompanies her on her hikes). Image View: Thumbnails enlarge in viewer and may be further enlarged in new viewer. Information is provided on all images, large and small. Poppy Passion IV is 16 x 20 ins, 550 x 443, 200 KB. Bio: Don Judah admits that his formal education in art was limited to high school, college elective classes and numerous evening workshops. After forty four years in health care he has grasped the opportunities offered by retirement to further his education and concentrate on his pastels – how I empathise! For the last few years he has been involved in the La Strada del Arte art festival, taking two days to convert one of his pastels into an 8’ x 12’ work on asphalt. Don has exhibited locally including at the Merryville Winery, St. Supery Winery, and Mumm’s Napa Valley. Now there’s a thought – instead of having the wine and cheese at the gallery, have the paintings at the winery! A touch of genius, that! 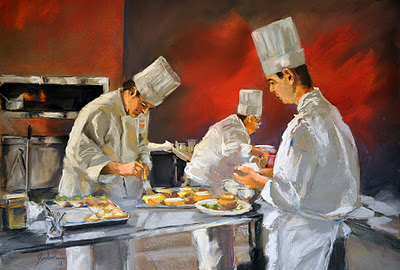 Don’s series of Napa Valley Chefs is on exhibition at the New Kitchen Gallery in Downtown Napa and in the Liken Galley. Style: Representational, but loose and painterly – would you believe a slight hint of Toulouse Lautrec? Navigation: This website is maintained by FineArtStudioOnline. Image View: Thumbnails enlarge in viewer, and can be zoomed further. Information is provided as a tooltip on the cursor.. Download is not prevented. Pizza Oven is 24 x 18 ins, 1024 x 691, 665 KB. Bio: Marie-Hélène Auclair worked as a dance teacher for about ten years before fulfilling her early ambitions to be an artist. She defines herself as a self-taught artist, and worked in other media before settling on pastel. She has won numerous prizes over the last ten years for her paintings, including the Pastel Journal in 2007 (where she had a feature article in December 2004). She has participated in group and solo exhibitions and she has been featured in Pratique des Arts on at least three occasions. She was also included in the 2006 North Light publication Pure Color – Best of Pastel. Marie-Hélène is a signature member of the Pastel Society of America, the Pastel Society of Canada, the Pastel Society of Eastern Canada, and a member of the Canadian Institute of Portrait Artists. Her past experience as a teacher of the dance has contributed to her success as a teacher of pastel. À St-Benoit de Mirabel au Québec, au détour du rang de la Fresnière, on y retrouve la maître pastelliste Marie Hélène Auclair, habitée d'une grande sensibilité, reconnue pour son style unique et son oeuvre d'un réalisme imposant. "Depuis toujours, peindre est pour moi une passion et un immense plaisir. C'est la façon dont mes sentiments les plus profonds s'expriment..." dit l'artiste qui, à travers les portraits et les natures mortes, fait ressortir les dimensions et subtilités de la vie.Portraits d'enfants, de vieux parents ou de fruits à l'air amusant, le jeu des couleurs et des ombres, l'effet de profondeur et la touche d'un coeur d'enfant, l'artiste peint avec un réalisme saisissant. Des expositions New-Yorkaises aux livres et magazines d'art américain et français, les oeuvres de Marie Hélène Auclair ne laissent personne indifférent. Le monde en pastel, une aventure multicolore d'une pureté à s'y méprendre. Subjects: Portraits, Still Life – preferably animate subjects. Navigation: This website is in French and in English. Page links remain available on bottom of page, except in the gallery pages, when they are on top (and very small). The French version has links to the Pratique des Arts articles that are not made available in the English version. Image View: Three pages of quite little thumbnails that enlarge on in an Adobe Flashplayer viewer on the same page, and can be zoomed. Information is provided on medium and dimension. Download is not possible. Bio: Quebec artist Caroline Guernon has been painting for more than two decades. She graduated in 1997 from the University of Concordia with a Bachelor of Fine Arts and a year later with a BACC from the University of Quebec (Montreal). She has latterly devoted herself entirely to pastel, becoming a member of the Pastel Society of Eastern Canada. In 2008 she studied with Rémy Lacroix (already featured on this blog), and in 2009 with Master Pastellist Marie-Hélène Auclair (coming shortly!). She has enjoyed numerous group and invitational exhibitions and her work was featured in the French art journal Pratique des Arts, issue 81, August 2008. Subjects: Still Life, Landscape, Figures. Style: Representational - with an abstract touch. Navigation: Page links remain available on top of page. Image View: Some thumbnails (not the majority) enlarge on new page, and can be saved. Information is provided on medium and dimension. Visite au coeur du vieux Québec is 12 x 17 ins, 914 x 615, 213 KB. I have just completed a trawl through all the artists' websites from the beginning of this blog up to the end of 2010. I checked all the links, and found that several needed to be updated. Inevitably, some sites are now defunct - for the main part, those that never seemed to be well maintained. And of course some deceased artists' sites are no longer maintained. However, I would like to link back to William Rambaldi in Italy, and especially to Robert Jessel, of Boca Raton, Florida. I checked the Florida pastel societies, to find there are three - Southwest Florida, North Florida, and Central Florida - but nothing for the Southeast. So if anyone out there - especially in Florida - knows how I can contact Robert Jessel, or whether he has a new web address, I would be very grateful for the information. Bio: Born in Colorado, raised in England, Mike Beeman has spent the last 43 years in Wyoming. 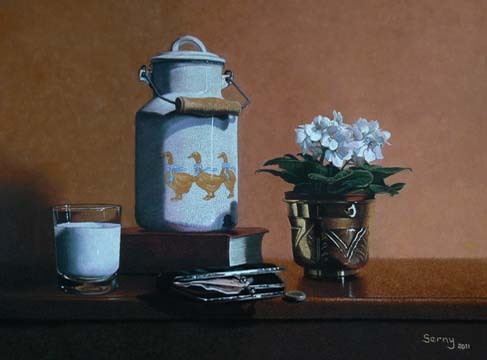 Mike’s work has won several awards in pastel, oil and watercolor in both regional and national exhibits since 1971 and his work hangs in private collections around the world. He was selected in the Pastel Journal's 100 Annual Competition for 2005 and 2007 for his portrait and figurative work and 2011 for his still life. Mike is a signature member of the Pastel Society of America and the Pastel Society of Colorado; he is also a member of the Pastel Society of the Northern Rockies and the Degas Pastel Society. Mike is represented by Deselms Fine Art in Cheyenne, Wyoming, and Eisele Gallery of Fine Art in Cincinnati, Ohio. Style: Representational - nice loose, painterly style. Gallery: Works (seems to contain all the other categories); Still Life Gallery; Figurative and Portrait Gallery; Wildlife and Animal Portrait Gallery; Plein Air Gallery. Image View: Thumbnails enlarge in new window and can be further enlarged, and saved. Information is provided on medium and dimension. Sparrow is 5 x 7 ins, 550 x 384, 121 KB. Bio: French artist Yves Serny was born in Villegly in the the Aude. A self taught painter, he has drawn since childhood. In the 1990s he made two discoveries : on the one hand the works of old pastel masters such as: Quentin de La Tour, Chardin, Degas, Mary Cassat; on the other those of contemporary pastellists exhibiting in the Société de Pastellistes de France summer show in Feytiat, Limoges. In 2007, he took masterclasses with major French pastellists to perfect his technique. After a career in public service, he has now retired. His works can be seen at his own personal exhibitions. In the last ten years he has exhibited frequently in the Languedoc and Midi-Pyrenees regions, where he has been awarded many prizes. M. Serny lives at Conques sur Orbeil, in the Aude. Yves Serny est né à Villegly dans l'Aude. Peintre autodidacte, il dessine depuis l'enfance. C'est au cours des années 1990 qu'il fait une double rencontre, les oeuvres des maîtres pastellistes anciens : Quentin de La Tour, Chardin, Degas ou Mary Cassat mais aussi celles des maîtres pastellistes contemporains réunis tous les étés au Festival international du pastel (Société de Pastellistes de France) qui se tient à Feytiat en Limousin. En 2007 c'est près des maîtres pastellistes qu'il se perfectionne. Adoptant définitivement le pastel sec, les natures mortes sont maintenant ses principales sources d'inspiration. Après une carrière professionnelle dans la fonction publique, enfin il a pris sa retraite. Ses œuvres sont visibles à l'occasion d'expositions personnelles. Il participe aussi depuis une dizaine d'années à de nombreux salons dans les régions du Languedoc et de Midi Pyrénées où il a souvent été primé. M. Serny habite à Conques sur Orbeil, dans le département de l'Aude. Navigation: This website is bilingual, in French and in English. Image View: Fifteen thumbnails that enlarge in a new window. Title and image size are provided. Attempts to download are frustrated, as all images apparently download as GIFs - but what you receive is not the painting as posted. La Verre de lait (The Glass of Milk) is 48 x 36 cm. Bio: It was in a moment of serendipty that I happened upon pastel artist Richard Banh. I was doing a search for Denise Larue Mahlke, while updating the links on my blog – Denise’s link had apparently disappeared. Luckily I found the updated URL, but discovered Richard Banh in the process, as he attributed his artistic development to Denise on his website. So what little I know about Richard is gleaned from his own site. 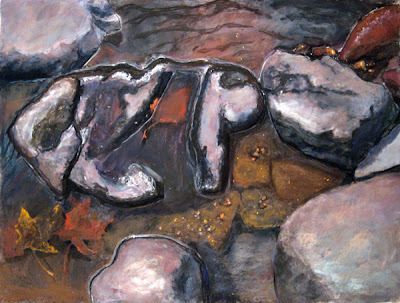 Richard took art classes for three years in 2007 thru 2009 from Denise Larue Mahlke, first intending to paint in oil. He was introduced to pastels during her classes and was intrigued enough to switch mediums. He took more workshops with Susan Carlin, Libby Peters, Bob Rohm, Rae Andrews and Rita Kirkman, and made such progress that he was awarded Best in Show for one painting and Honorable Mention for another in the Texas Pastel Society's "Celebrate Texas" 2011 Regional Juried Competition/Exhibition. Subjects: Landscape; Portraits ; Still Life. Banh’s strength is in Landscape. Gallery: Landscape; Portraits; Still Life; Plein Air; Animals. Image View: Click on thumbnails to enlarge in new window. Information is provided on image size, and download is permitted. Where Silver Linings Flow is 20 x 16 ins, 1000x798, 937 KB. Bio: Lee Kimball graduated with a Bachelor of Arts Degree from St. Ambrose College in Davenport, Iowa, and spent the next twenty-five years working in graphic design and illustration. During this time he painted in watercolour, until he took up pastels in 1994, scribbling on brown wrapping paper with a small set of Rembrandts. After only a year he decided to pursue a career in fine art on a full time basis and was immediately accepted into the Pastel Society of the West Coast and the Pastel Society of America. 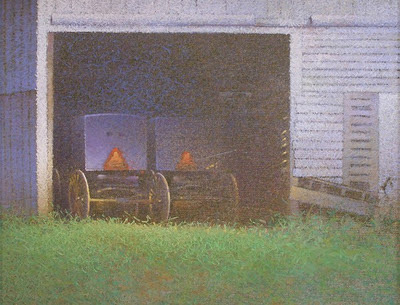 His work has been the recipient of many awards including the 2000 Joseph V. Giffuni Memorial Award from the Pastel Society of America. 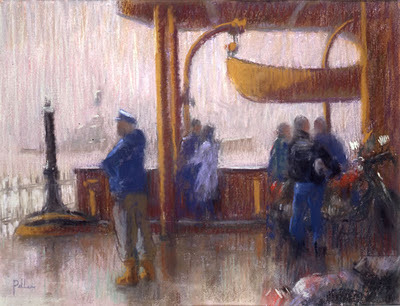 Mr. Kimball is a signature member and Master Pastellist, Pastel Society of America as well as a signature member and Distinguished Pastellist, Pastel Society of the West Coast. His work is held in many collections, both business and private. 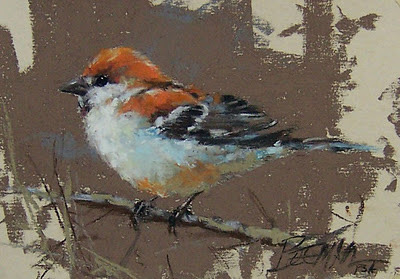 His work and technique was featured in the Pastel Journal, November/December Issue, 2000. Image View: Click on thumbnails to enlarge in new window. Information is provided on image size, and download is permitted. Amish Buggies is 16 x 20 ins, 600x247, 90 KB. Bio: Karen Israel began painting seriously over a decade ago and started to exhibit in 2006. Her work has been accepted into many national and international juried shows and has won numerous awards, including the Joseph V. Giffuni Foundation Award of the Pastel Society of America in 2009. Karen has taken workshops with Leslie Lillian Levy, Christine Ivers, Robert Norieka, Kristine Sullivan, Frank Federico, Alain Piccard, Richard McKinley, Claudia Seymour, and Susan Ogilvie. 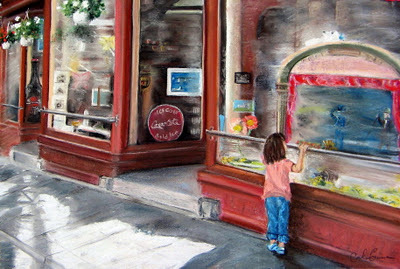 She is a member of Connecticut Pastel Society, Pastel Society of America (Associate Member), Connecticut Women Artist Association, Audubon Artist, and an elected member of the West Hartford Art League. Subjects: Landscape; Still Life; Portraits – her portraits are imaginative, full of action, especially those of children, which manage to avoid the saccharine. Navigation: Links remain available on top of page. Gallery and images are straightforward. The “Home” page seems to me redundant. Gallery: Landscape; Still Life; Portraiture. Image View: Click on thumbnails to enlarge in slideshow. Information is provided on image size, but download is not possible. I chose Surface Tension as a sort of compromise between Landscape and Still Life. It measures 24x19 ins.